Thank you for sitting still for me for this sketch even though that wasn’t your idea of fun. The oldest son of my best friend from elementary school in Germany has been wonderful to have around for four weeks this summer. He and I spent a lot of time together. Fortunately we connected really well. I will miss him a lot. I think he will miss us a bit too, and he will remember his first Canada experience for a long time. Besides flying for the first time in his life (and it was a 10-hour flight), so many firsts for this 6 ft. 2, almost-17-year-old, that we were able to introduce him to: kayaking (and capsizing), backpacking, beach volleyball, pitch and putt golf, attending a baseball game, a CFL football game, an MLS soccer game, discovering sushi and other non-western foods, and how good a burger can be that does not come crawling out from under some golden arches. He learned how to do laundry, how to clean a complete bathroom, and what the different cleaning agents do. He learned how to cook pasta on his own (I talked him through the steps over the phone one night when Jeff and I were out and he was home alone and hungry — it felt like landing an airplane remotely). He learned about big city problems as well as advantages and saw a bit of the diversity that makes up Vancouver. Goodbye T. Your youth, energy and enthusiasm made my summer a lot of fun. You are a great person, and I am glad I got to know you. 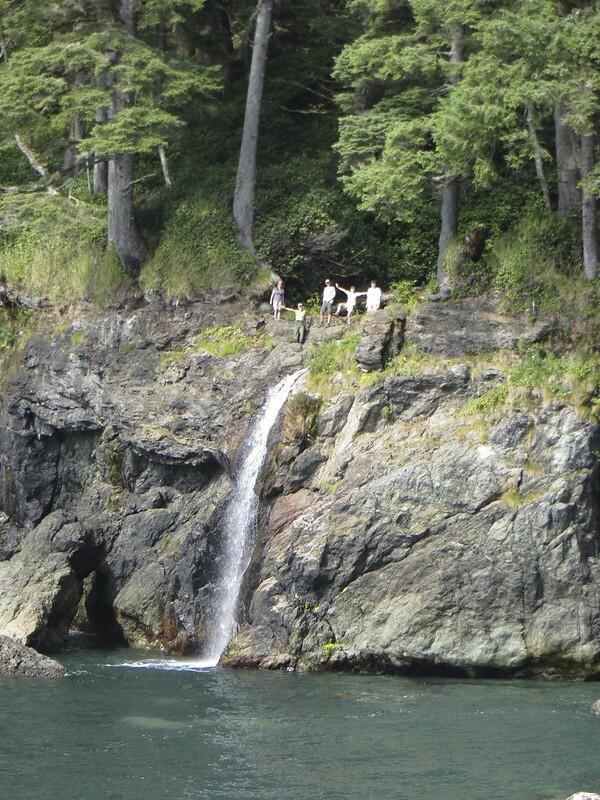 A bit blurry, but I like this shot of 5 of our group of 6 hikers above a waterfall, close to our destination of Sombrio Beach on the Juan de Fuca Marine Trail on Vancouver Island. L to R: Me, Jeff (my husband), our teenage visitor, my sister, a friend.